It has been said earlier how the authorship of the massive fortress in Agra is being falsely attributed to Akbar. In a similar manner, Akbar is being projected as the author of another fort-palace complex, a excellent example of Hindu architecture, at Fatehpur Sikri, nearly 37 Km away from the city of Agra. The so called pseudo secular and the Marxist historians are propagating the idea that the place was originally called Sikri and it was a small village surrounded by deep forest infested with wild animals. In that village, a Sufi saint called Shaikh Salim Chisti began to live in a small hut in 1537. At that time, Akbar was mentally upset as he did not have a male child. One should notice that the statements quoted above are terribly inconsistent. According to Smith, Akbar began the construction of the city in 1571 (or 1569) and before that the place was a small village. According to R C Majumdar, in 1571, Akbar decided to use the auspicious place as the capital of his empire. But according to the Wikipedia Encyclopedia, “Akbar started to use the place as the capital of his empire from 1571 and continued to use the place as the capital up to 1585.” The question naturally arises – How many years Akbar took to convert the small village Sikri into a city? Was it possible for Akbar to shift his capital to Sikri before the completion of the said construction? The most ridiculous part of the episode is that, according to Wikipedia Encyclopedia, Akbar started to use Sikri as his capital in the same year the construction of the city had begun. So, it implies that, Akbar, in 1571, had shifted his capital from the city of Agra to a desolate village called Sikri, surrounded by jungles. The reader might have noticed another anomaly in the above narrations. According to some authors, the construction of the city was completed in 1585, and in the same year it was abandoned due to scarcity of water. As if the so called scarcity of water fell, all on a sudden, from the sky without giving any prior hint and no body could foresee that. Most importantly, these contradictory statements lead one to conclude that Akbar the fool spoiled so much money for setting up the new city in vain. It has been pointed out above that historians believe that Akbar built the Buland Darwaza (the Great Portal) in 1601 as a monument after the conquest of Gujarat . In this regard, our historians write, "The southern entrance to the Jam-i-Masjid at Fatehpur Sikri was considered to be suitable position, and the original entrance was replaced by the construction of a massive portal. This was known as the Buland Darwaja.”  It is important to note here that originally there was a gate where the Buland Darwaza stands today. Common sense tells us that the said gate was very old and hence Akbar found it suitable to demolish that worn out gate and make a new one. Had this older gate been built by Akbar, hardly 15 years ago, he would have certainly not shown any interest to demolish the same to be replaced by the new gate called Buland Darwaza. We now may pay heed to what another group of historians, known as nationalist historians, have to say in this regard. These historians are convinced that the authorship of the fort-palace complex at Fatehpur Sikri is being falsely attributed to Akbar. According to them the city, now known as Fatehpur Sikri, was a thriving and prosperous city from very older times. Once upon a time, during the times of Babar, Akbar’s grand father, the fort-palace complex at Fatehpur, was under the occupation of Rana Sangram Singh of Mewar. In 1527, a battle was fought between Babar and Maharana Sangram Singh, known as the Battle of Khanua, in a field close to the fort of Fatehpur. In that battle Babar defeated Rana Sangram Singh and thus the occupation of the fort went to the Mughals. There are many references to show that fort at Fatehpur (or Fathpur) was there even centuries before the times of Akbar. The Muslim chronicler Yahya bin Ahmad, in his Tarikh-i-Mubarakshahi, writes, “On the 19th Jumada-l awwal, 808 H ( 12th November, 1405 AD), a battle was fought between them (Khizr Khan and Ikbal Khan). At the first charge, Ikbal wasa defeated and fled. …(Later on) He was killed and his head was cut off and sent to Fathpur.”  The statement is sufficient to prove that, at least 150 years before the times of Akbar, Fatehpur Sikri was a place of political importance, not an isolated village surrounded by jungle. At that hour, Babar sent an advanced team of 1000 men, under the care of Abdul Aziz and Mollah Apak, to assess the situation and collect prior intelligence. To describe the situation, Babar writes, “… without taking any precautions, he (Abdul Aziz) advanced as far as Kanwahah, which is five kos from Sikri.”  But a troop of 4000 or 5000 Rajputs routed them and compelled them to return to their base. As mentioned above, Babar camped outside the wall of Sikri, near a big tank and the Rajput camp was inside the wall. The chief Rajput generals were Rawal Udai Singh, Medini Ray, Bhamal, Varmadev and Siladitya, the caretaker of the Raisin Fort. Beside that, there were a few Afghan generals in the Rajput army and the most prominent among them were Hasan Khan and Sikandar Lodi. After being thrashed at Kanwahah, the Mughal army became extremely frightened and advised Babar to retreat. So, from the above facts, it becomes evident that, if the Rajputs continued their attack from the incident of Kanwahah, the Mughal army would have defeated and dispersed. But Sangram Singh took time and gave the Mughal army an opportunity to re-assemble. In this context, we should note another development. Babar had initiated a dialogue with Sangram Singh through Siladitya, but later on he succeeded to bribe Siladitya to bring him to his side. This enabled Babar to gather some vital military secrets of the Rajput army. Babar continues, “The battle was fought within the view of a small hill, near our camp. On this hillock I directed a tower of the skulls of the infidels to be constructed. … Immense numbers of the dead bodies of the pagans and apostates had fallen in their flight, all the way to Bayana, and even as far as Alwar and Mewat.”  After entering the fort, Babar ordered general massacre and Muhammadi and other Mughal generals cut down the civilians of the city of Sikri en masse. There are no proper records of how many Hindus were slaughtered on that day. The so called secular and Marxist historians always try to keep the figure low. It has been mentioned that there were 80,000 strong cavalry and 500 elephants in the Rajput army. Hence, many believe that, including the foot-soldiers, the Rajput army was 200,000 strong, and nearly 100,000 of them were taken prisoners and slaughtered on that day. In addition to that, about another 100,000 civilians were massacred in the city. It has been mentioned earlier that after the mass-massacre of the Hindus in the Chittor Fort by Akbar, Rajput Kings abandoned the fort and thereafter, they used the fort at Udaipur as their residence and the seat of the government. In a similar manner, the Rajput kings had abandoned the Fort of Sikri after the mass-massacre by Babar, as mentioned above. And, as a result, the city of Fatehpur Sikri gradually turned into a desolate jungle. Later on, Akbar perhaps took an initiative to revive the city by clearing the jungle and our dishonest historians are portraying that as Akbar’s creation of the new city of Fatehpur Sikri. 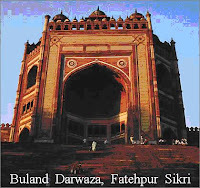 A study of the history of Fatehpur Sikri, it appears that, Akbar might have built a minutely small part, the Buland Darwaza, of the entire edifice and nothing else. And later on, he might have built the tomb of Shaikh Salim Chisti. Another point of vital importance should be highlighted in this context. Anyone, whosoever has visited the Fort-Palace complex at Fatehpur Sikri, it must not have escaped his notice that all the palaces and buildings reveal overwhelmingly Hindu style of architecture and stone carving. According to experts, they are either of Rajasthani or Gujarati style. This is due to the simple reason that the Rajput Hindu kings were the real authors of those buildings and palaces. But to hide the true history, the despicable creatures, callef secular and Marxist historians, say that, Akbar engaged both Hindu and Muslim artists of Persia for building the palaces and stone carving. They also say that, Akbar was so generous that he had no hesitation to accept Hindu style of architecture. But all these lies are going to be exposed very soon as the real history of Fatehpur Sikri has started to reveal due to fresh archaeological discoveries. We expect to deal that aspect in the next installment. H.M. Elliot and J. Dowson, The History of India -As Told by Its Own Historians (in 8 volumes), Low Price Publication, Delhi (1996) V, 332-333. V. A. Smith, Akbar the Great Mogul, Oxford Clarendon Press, 105. V. A. Smith, Akbar the Great Mogul, ibid, 104-105. R. C, Majumdar, The History and Cultures of the Indian People, Bharatiya Vidya Bhavan (in 12 Vols) ,VII ,125. V. A. Smith, Akbar the Great Mogul, ibid, 107. R. C, Majumdar, ibid, Bharatiya Vidya Bhavan, VII, 760. R. C, Majumdar, ibid, Bharatiya Vidya Bhavan, VII, 763. H.M. Elliot and J. Dowson, ibid, IV, 40. H.M. Elliot and J. Dowson, ibid, IV, 62. H.M. Elliot and J. Dowson, ibid, IV, 268. H.M. Elliot and J. Dowson, ibid, IV, 267. H.M. Elliot and J. Dowson, ibid, IV, 269. R. C, Majumdar, ibid, Bharatiya Vidya Bhavan, VII, 36. H.M. Elliot and J. Dowson, ibid, IV, 272.